Imagine someone massaging your feet and giving special care or say a pedicure to you! Isn’t it relaxing? We put our feet into the most comfortable pair of shoes and still long for the pedicures and foot massages. Now, imagine your dogs walking barefoot on all those things where your Jimmy Choo steps. A hot pavement, biting frost, mud, wet pools, chemicals and what not! They do not demand of any special foot care from you, but it is obvious that they may be having a hard time with their unattended paws. Did you know that paws are the only medium of releasing perspiration and heat other than panting in dogs? Caring for your dog’s paws is just as important as their flea treatments. To balance their stepping into unfavorable platforms like chemicals, hot pavements, frost laden ground, soil, etc. it is inevitable to take proper care of your furry friend’s paws for adequate cushioning and insulation. Let’s check the top 5 paw care tips for dogs! Nails- Cut when you hear the click! When your pooch walks on the floor and you hear the clicking of their nails, the time has come to trim their nails. Try to trim their nails before they rip any of your cushions and dismantle the carpets. Canines enjoy digging and the dirt is bound to get into their nails. It may be worth to take time out of your busy days to clean their nails and fur between the pads. Your pooch’s paws may have to face many unclean substances like debris, chemicals, grit, thorns, etc. during their sprints or play. You need to clean their feet regularly to avoid any unwanted damage to them. Use a damp cloth or a mild soap to clean your canine’s feet. Don’t forget to clean between their toes. Human soaps and shampoos are extremely harmful for pets. It is recommended not to use them. During the dry winters or whenever you feel that your pooch’s paws have turned dry and cracked, go for moisturizers. Ask your vet to suggest a suitable and quality pad moisturizer. Apply as directed to give your pet’s feet a perfect feel and look. Barefoot on a hot pavement! Can’t just imagine it! Isn’t it? Your canines bear the hot pavement and sand during the extreme scorching climate which is really not good for their paws. Avoid taking them for a walk at peak sun hours and if you do, make him wear dog shoes. Check for blisters and other injuries during summer season. If you see any, apply anti-bacterial wash and cover their paws with a bandage. Pedicures- A must to make them feel relaxed and pampered! The pedicures are always supremely relaxing. Your loyal buddies deserve to get pampered professionally at the dog spas by pedicures. They would massage their feet with great efficiency resulting in beautiful paws. What you may miss doing for their feet, will be managed by the pedicures! So, are you all set to care for your dog’s paw care this summer? 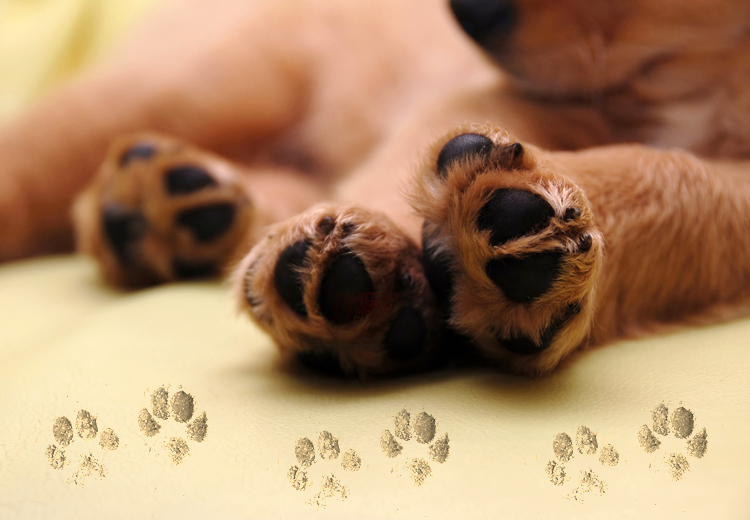 Follow these tips to maintain the health and charm of your furry pal’s feet. Those are things that will bring them to you!